Betsy-Tacy, as seen on the “Contemporaneous Reception of the Text” page, received positive reviews. Maud had not planned to write any sequels, but the book’s popularity convinced her to continue the series for a total of ten books and three satellite titles. Elizabeth Riley, Maud’s editor at Crowell for the Betsy-Tacy books, was the plenary speaker at the 1997 Betsy-Tacy Convention in Mankato, Minnesota. Riley said that she saw the manuscript for Betsy-Tacy after it had been entered into a contest that it did not win. She explained that she asked Lois Lenski to illustrate the book and then Lenski visited Mankato to research the Hill Street (Center Street) neighborhood. The endpapers of the early printings have Lenski’s bird’s eye view of the area surrounding Betsy and Tacy’s houses. Lenski’s illustrations were a very positive addition to the book and the fact that the inside ones have been retained through every subsequent printing is a testament to their appeal and quality. The Betsy-Tacy books were very popular while they were being published. Those early readers remember waiting impatiently for the next book in the series to arrive at bookstores. Fans of the books who read them as children have fond memories of rereading them then and for the rest of their lives. The Crowell Company marketed the books and Maud did book tours across the country. A special tour was planned for the publication of the final book: Betsy’s Wedding. 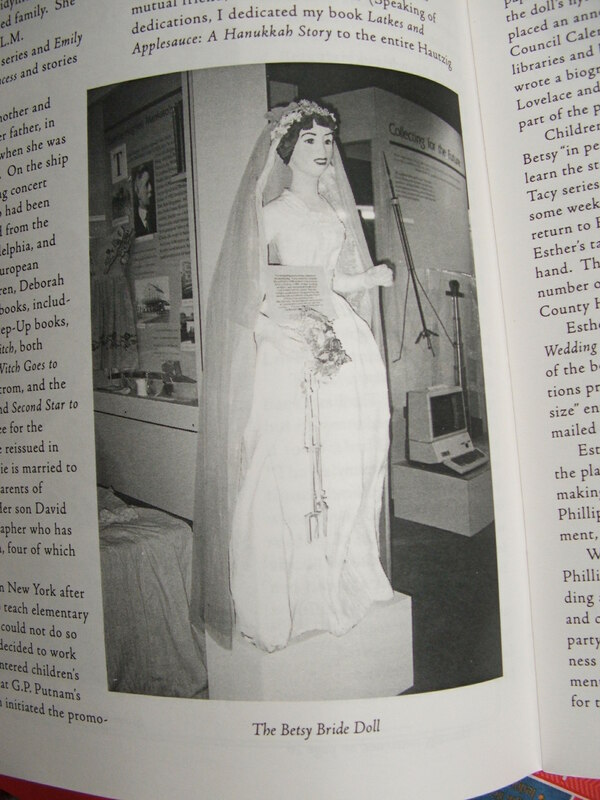 Esther Hautzig, assistant to Elizabeth Riley and an author herself, arranged for two life sized paper maché Betsy Bride dolls to travel with Maud when she went on her book tour. One of the dolls is on permanent display in the Blue Earth Country Historical Society in Mankato, Minnesota. 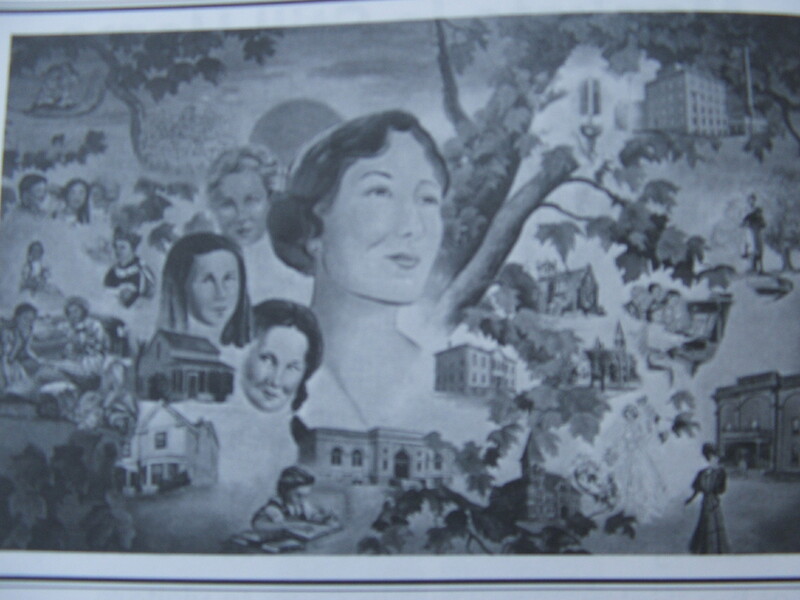 Mankato held “Betsy-Tacy Days” in 1961 and dedicated the Children’s Wing of the Blue Earth County Library the “Lovelace Wing.” It has a mural that shows Maud in the middle and many characters and places from the books. The Lovelace wing contains signed copies of the books, original Lenski illustrations, and the glass pitcher that Frances Kenney gave Maud for her fifth birthday. Members of the Betsy-Tacy Society conducted a letter writing campaign in the early 1990’s that led to Harper Collins rereleasing the first four books with cover art by Diane Goode. The next four books were reprinted with cover art by Goode as well, but it was criticized. Many people felt that sales would have been better if the original cover art had been reproduced. The next two books in the series were reprinted in 1996 with new cover art by a different illustrator. In 2001 the three satellite books were reprinted in hardcover and paperback. (Original copies of these three rare titles were selling for as much as $900 each on the eBay auction site.) The most recent reprintings are paperback omnibus editions that contain two books each and reproduce miniature versions of the original Vera Neville cover art. 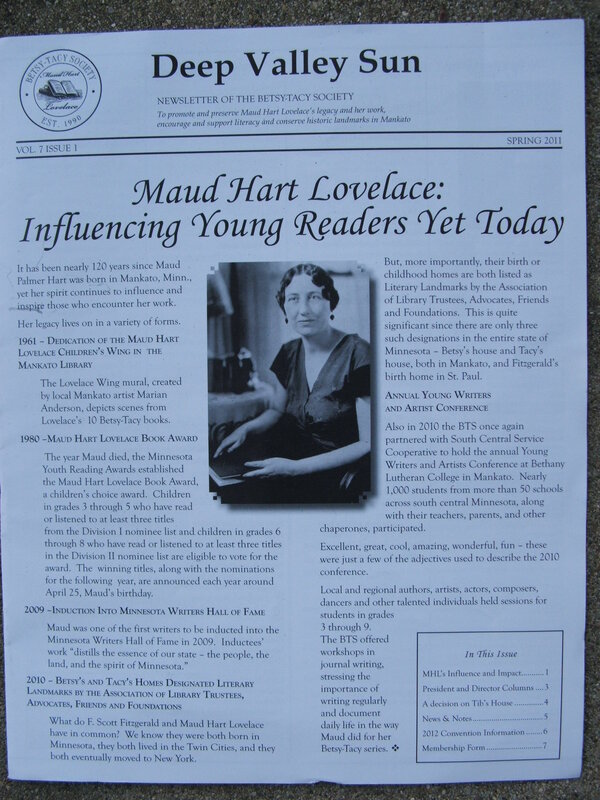 There is a children’s book award named for Maud since 1999: The Maud Hart Lovelace Book Award is sponsored by the Minnesota Youth Reading Awards. The 2011 winner is Deep & Dark & Dangerous by Mary Downing Hahn. The fans of the Betsy-Tacy books include writers and celebrities: Judy Blume, Anna Quindlen, Meg Cabot, Fran Manushkin, Bette Midler, and many others. These people have contributed introductions and quotes for the new editions since 1993. Norma Johnston dedicated her book The Wishing Star to Maud. Some critics, such as Deborah Stevenson, argue that the support of older fans cannot sustain a book if it is not naturally “popular” with young readers. It is a chicken and egg story: if the publisher does not reprint the book, how will it be available for the next generation of young readers? The supporters do much of the marketing work for the publisher because they spread the word that the books are valuable and available, give copies of the book as gifts, and convince teachers and librarians to offer the book. As long as the books’ supporters work to keep the books in print and spread the word that they are excellent material for children, they will remain in print for future generations to enjoy and treasure. The qualities of Betsy-Tacy that have made it memorable for young readers are its timeless portrayal of friendship and family life. The parents are supportive of their children’s aspirations and interests. The Rays assume that their daughters will aspire to careers. The gregarious and outgoing Betsy is a counterweight to shy Tacy. They are inseparable and the epitome of perfect friendship that lasts a lifetime. In addition to outdoor play, games, and paper dolls, Betsy tells Tacy stories with themselves as characters. Tacy is Betsy’s audience, her sounding board. Betsy is also the person Tacy goes to when her baby sister dies and the world has become a threatening place. Betsy suggests that they place their favorite Easter egg up in a bird’s nest so that they can share it with the baby in heaven. When Betsy’s little sister is born and she feels envious and out of sorts, it is Tacy who comforts her. It is clear from this book that good friendships can create wonderful childhood memories that last a lifetime. Wow – this is a REALLY cool piece, Julia! Love it!